Zion's Ponderosa Resort will happily answer your questions and provide any information that you need. Simply fill out the form below, click "Submit" and your request will be forwarded to Zion's Ponderosa Resort for their prompt attention. 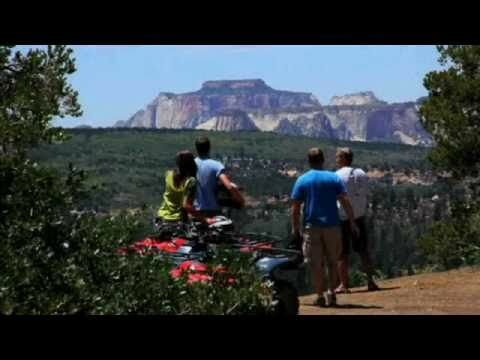 Find yourself exploring trails and gazing down into Zion National Park on our ATVs, horseback or 4 wheel tours. Zion Ponderosa extends for miles along the eastern boarder of the park. The beauty and breathtaking vistas at Zion Ponderosa are unmatched. Our certified guides will accompany you in rappelling, ATV tours, 4 wheel tours, paintball games and much more. There is something for everyone at Zion Ponderosa. After a full day of activities our pool and hot tub and complete meal service including T-bone steaks, flame broiled rotisserie chicken, Rocky Mountain trout, baked potatoes, vegetables, tossed salad, fresh baked rolls, drinks and dessert will be waiting for you! Check out our Recreation Barn! There is always something happening at the recreation barn. We have both indoor and outdoor climbing walls to challenge your skills. Our certified guides will assist you in hooking up to our zip line that will give you a thrill that is unmatched. Other activities and games include Basketball, Tennis, Sand Volleyball paintball, pool, foosball, and ping pong. Zion Ponderosa's kids camp is perfect for the younger children in your group.